The best way to get rid of snakes under a house or other building is to hire a professional, especially if it is large or poisonous. However, if you cannot afford one, you can try to trap a snake. Snake traps are effective only for a short while as the snakes will learn to not go in there. You can buy these traps online or in a garden shop or you can call a local animal control office to see if you can rent one or borrow one. Make sure you wash the trap thoroughly before you set it to get your scent off of it and then trigger it while wearing latex gloves. Make sure that you check the trap everyday and once you have caught the snake, relocate it at least 15 miles away from your house. Wear heavy gloves while you do this because the snake will probably strike. The best way to prevent snakes or discourage them from staying in your yard is to keep your grass cut very short. Snakes like to hide in long grasses or at the base of bushes and if you do not give them this place to hide, they are less likely to stick around. You can also try building a fence around your building or just around your porch or shed or at the base of your house. A fine wire mesh fence is probably best to keep out snakes as it is impossible for them to find an opening big enough to squeeze through. Picket fences are not very effective when trying to get rid of snakes. There are several different repellents available that claim to get rid of snakes, but they are not as effective as the other methods. It is rumored that snakes don’t like mothballs, but this is not proven. Some of the repellents that are available are mongoose and king snake, but for them to be effective you have to constantly reapply them and you will end up spending a lot of money. You can attract predators to your house. Having a large cat or dog in the yard will discourage snakes from entering your yard as they prefer to be left alone…unless they are hungry. Owls and hawks are also great predators to have around, but you can’t force birds to stick around your property. Instead, build nesting boxes high up in the trees and you may get one to take up residence in your yard. You can also try to take away the snake’s food source to get them to leave or prevent them from staying. You can do this by limiting the small rodent/frog/bird population so they have nothing to eat. You can do this by trapping them, poisoning them or building really good fences that keep all animals out of your yard. 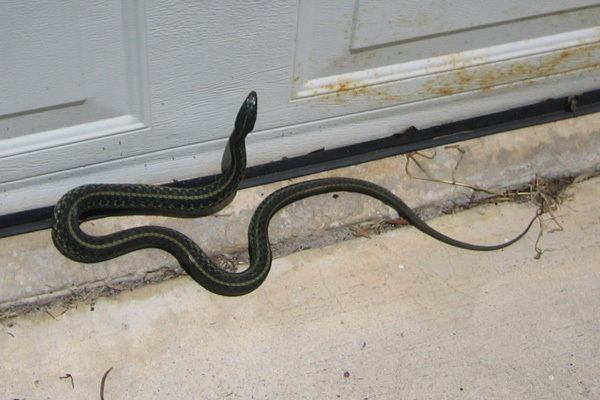 Go back to the main Snake Removal page for more information about snakes living under the shed, or living under some part of the house, such as snake under the porch or deck. Almost every single person on the planet has had a run in with these slithering creatures at some point or another, whether we wanted to or not. While there are many misconceptions about snakes, they are often an unwelcome guest in your back yard, under your porch or in your house. There are thousands of species of snakes, and only a handful of them are venomous. Actually, many species of snake are helpful to you as they keep the insect and rodent levels down to a minimum. Snakes come in almost any color and pattern variations which depend on the species and geographical location. However, even though snakes can be helpful, they can also be a nuisance.